What a busy month and wonderful feast of Inspiration The London Festival of Design brings to September. So much to see and so many great Designers. I certainly didn’t have time to see everything on offer. 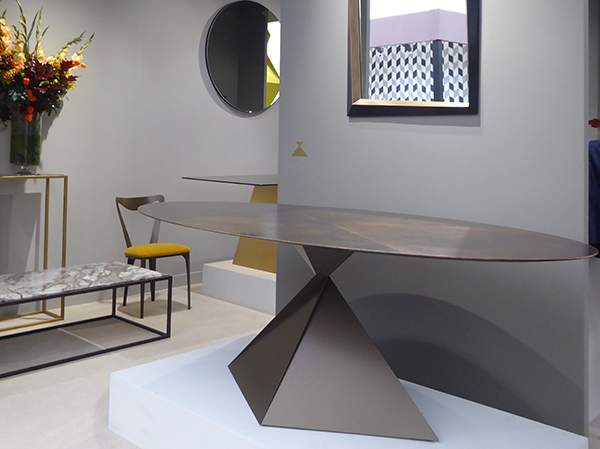 But after visiting Decorex, 100% Design and The London Design festival in Brick Lane – I have put together just a few of my personal high-lights. ‘Form, Texture, Print and Invention’ are my inspiration and the designers featured are a mix of established companies and emerging Brands. I really hope you enjoy seeing just a small glimpse of the talent that London had to show this year. Beauty of form, to me, achieves it’s purpose with understated design. Using simple lines or shapes that perfectly compliment each other. The beauty can be in the simplicity of it’s design or the beauty of it’s materials. Tom Faulkner is the first of my featured designers. 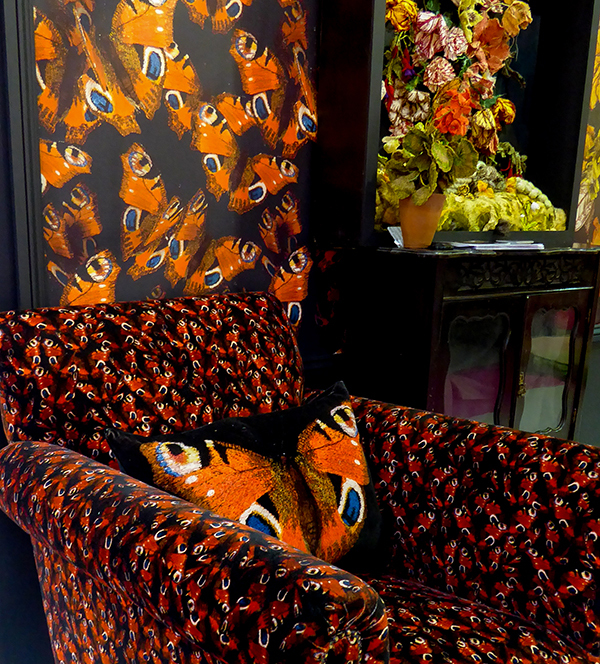 You could not miss Tom’s Stand as it had centre stage just inside the entrance at Decorex. I love the elegant uncomplicated style of Tom’s designs. Tom uses the beauty of various metals, stone, wood and glass in his designs and with all pieces being handmade in his UK workshops, every item is customisable. Tom deservedly won two awards at the International Design and Architecture awards this year. 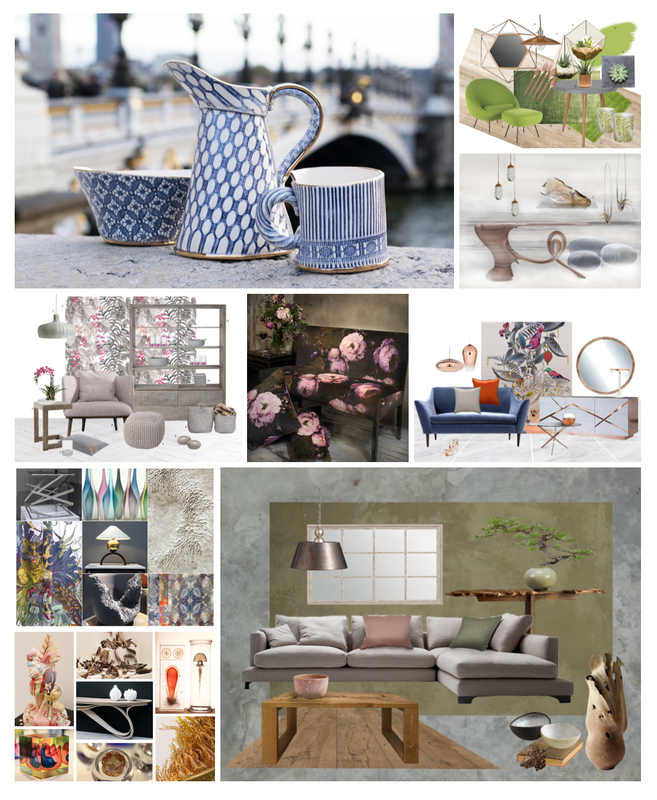 His winning Cabinet ‘Odessa’ we featured earlier this year on our Beauteous Botanical moodboard. 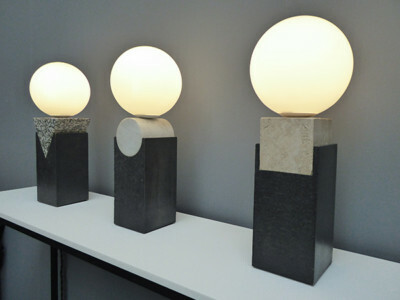 Louis Jobst exhibited at The London Design Festival in Brick Lane and last week featured in my Lighting post. I feel that he deserves a second mention, as his creations are a great example of using simple form to achieve pleasing design. Louis combines his Architect training with his design skills to create this elegant lighting. In his work I can see the way he mixes building a structure and creating a pleasing balance of form with function. 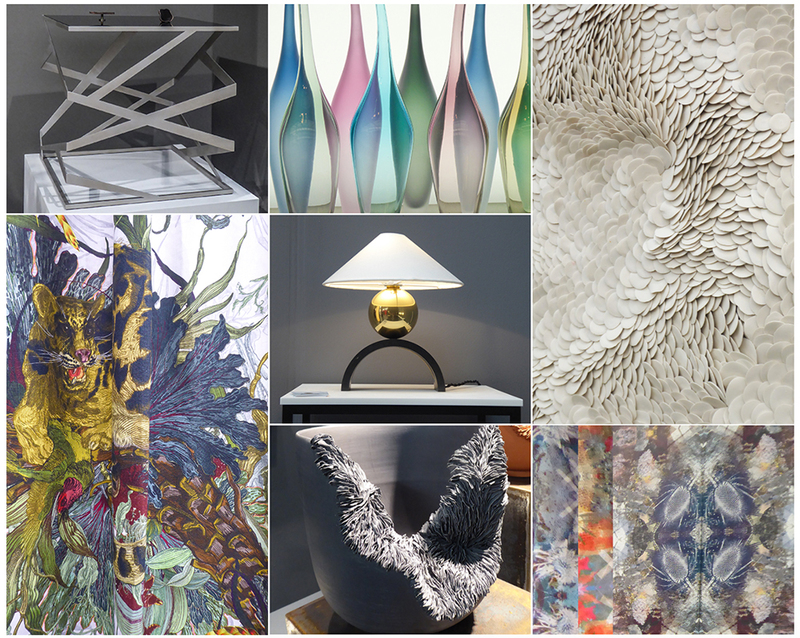 It was Jonathan Roger’s first time at Decorex and I recognised his beautiful displays straight away. 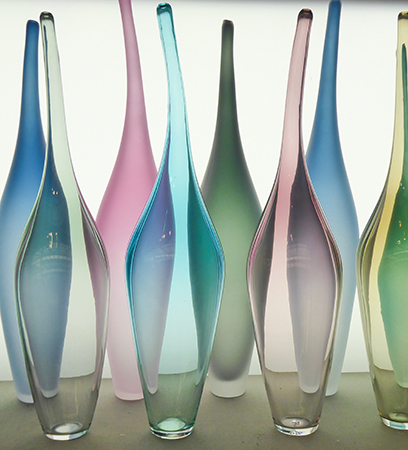 Presented in back lit shelving the beautiful forms and subtle tints of his glass-ware are captivating. Jonathan has a sensitivity to simple design form and an ability to combine and colours, that create a stunning display. 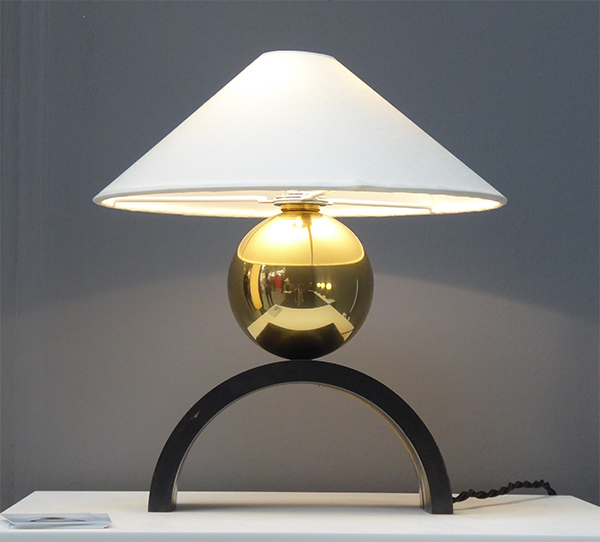 Pia Wustenberg caught my eye in the Future Heritage arena at Decorex. 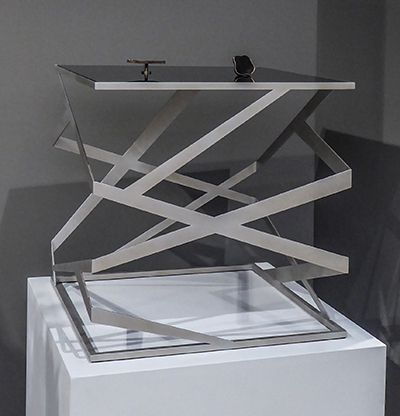 She displayed her range of Stacking Vessels, combining form and function, with a focus on design. 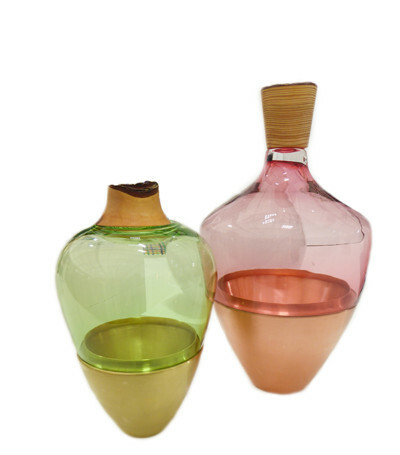 Pia combines different elements to create her work – the glass is blown in Wiltshire and the wood is turned in Finland. 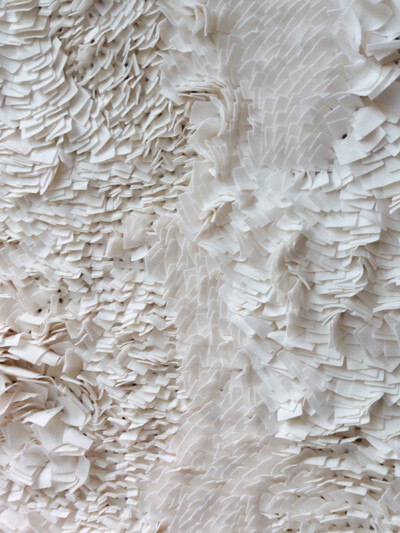 I always feel drawn to exciting texture and the way it can be used to create design. I love the way that one simple colour can be transformed by dimension and varying light. 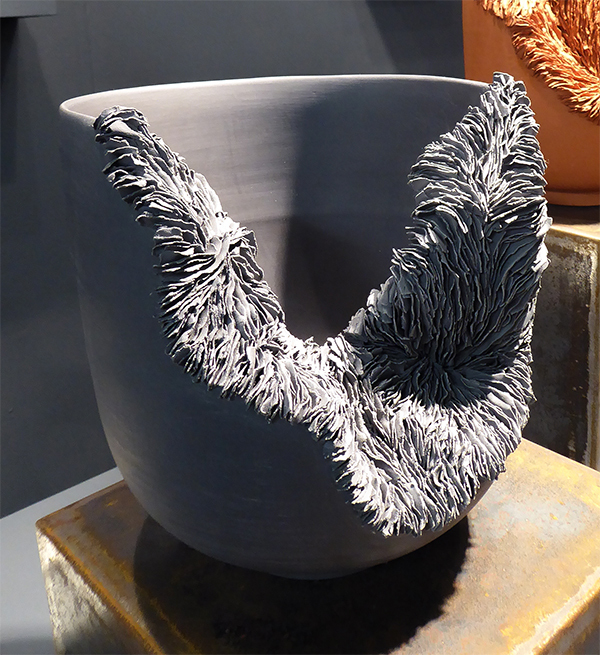 Fenella Elms at Decorex is an Artist whose work epitomises texture for me. I had admired Fenella’s sculpture on the internet and was keen to see it in real life and even more to meet the artist. 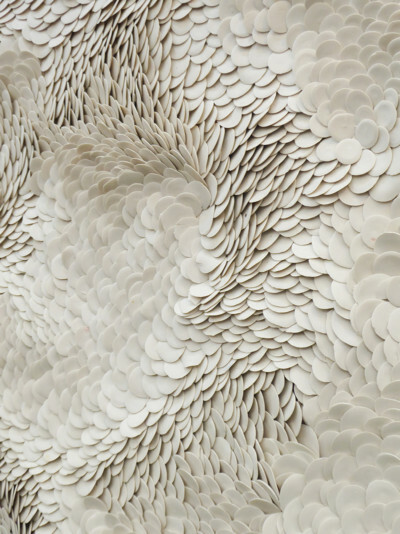 In her work Fennela creates porcelain in flowing formations and rhythmic structures. Playing with light and shifting with perspective. The results are mesmerising works of Art. Olivia Walker’s stand at The London Design Festival looked stunning, filled with her striking ceramics with delicate textured designs. Olivia throws simple porcelain forms that she then submerges in paper-thin accretions. The result is a resemblance of a living organism of fungus, coral or bacteria growing over and diminishing the form beneath. Theses are very beautiful ceramics that you feel you really want to touch. Vanessa Hogge is a ceramic artist that attracted a lot of attention at The London Design Festival. From her studio in Cockpit Arts in London she crafts these wall flowers in porcelain and black clay. 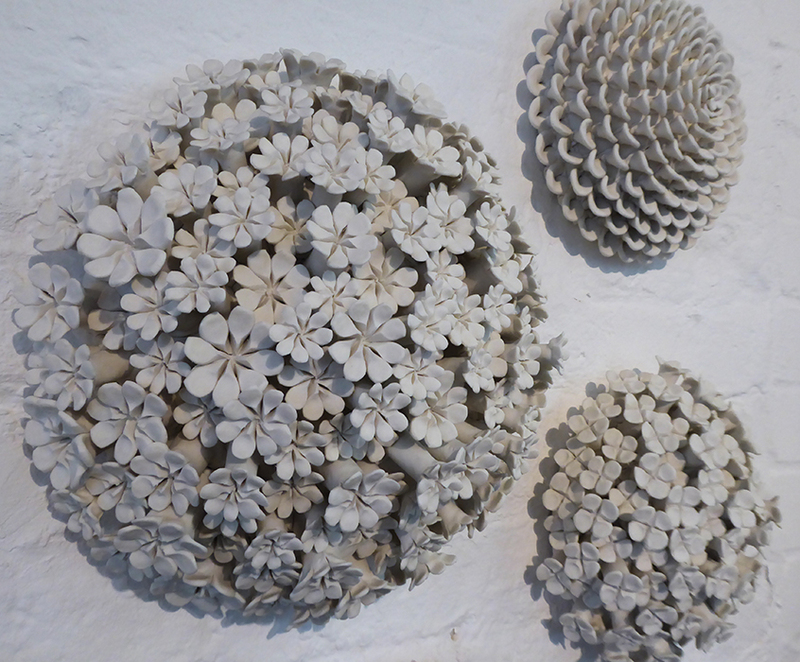 Organic, ornate and stylised, Vanessa’s sculptures are fired at a high temperature to produce ossified shades of off white and black. Polish textile artist Joanna Rusin, at The London Design Festival, described her work as a composition on canvas. This one-of-a-kind textile is handcrafted from wool and felt and although it looks to be made as a rug, it looks great as a wall hanging. 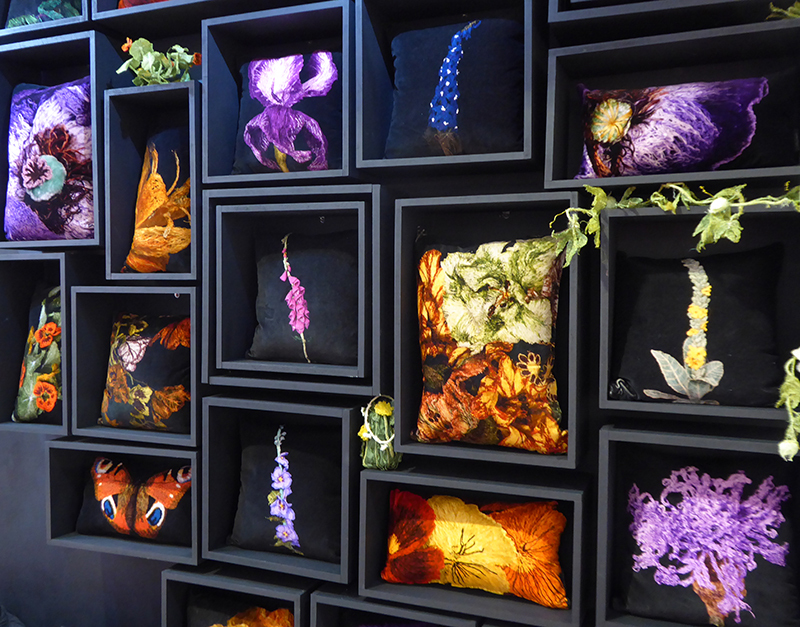 With Decorex being the first of my visits I couldn’t help but be seduced by the beautifully wild offerings of Timorous Beasties. 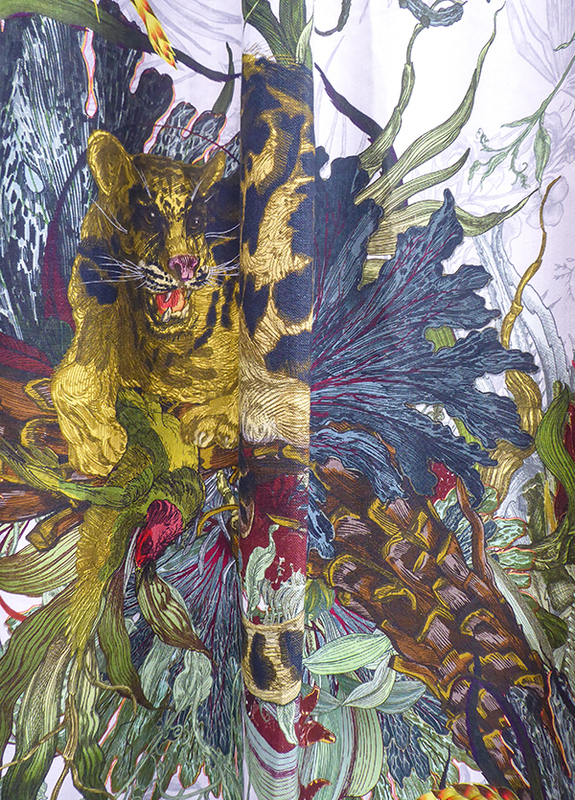 The design duo of Alistair McAuley and Paul Simmons never fail to produce impressive stunning prints. Their style is often an eclectic of mix of historic and contemporary to produce something uniquely beautiful. I was excited to see their new Tropical Clouded Leopard design. 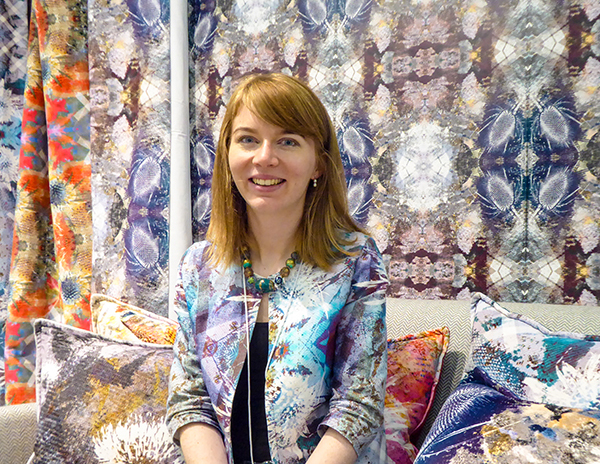 Brightening up 100% Design there was the colourful Lindsay Taylor. Lindsay has spent years creating three dimensional, embroidered artwork. Inspired by woodlands and rural landscapes. Lindsay now uses photographs of her embroidery to create her unique print collection. I loved the colourful cushion collection. Beautifully matching her stand here, Scottish designer Mairi Helena was showing her collection of prints. 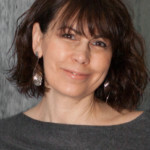 Mairi is also a commercial photographer and now combines her passion for photography and interiors to create her collection. Mairi mixes geometry and botany to create her unique designs. She tones them harmoniously and slightly distresses the print to give an informal glamour to her designs. 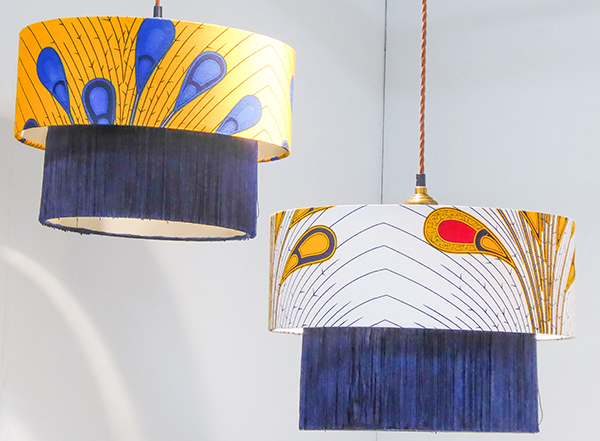 These tasseled lampshades are the creation of Designer Vanessa Agyemang of Copper Dust at The London Design Festival. 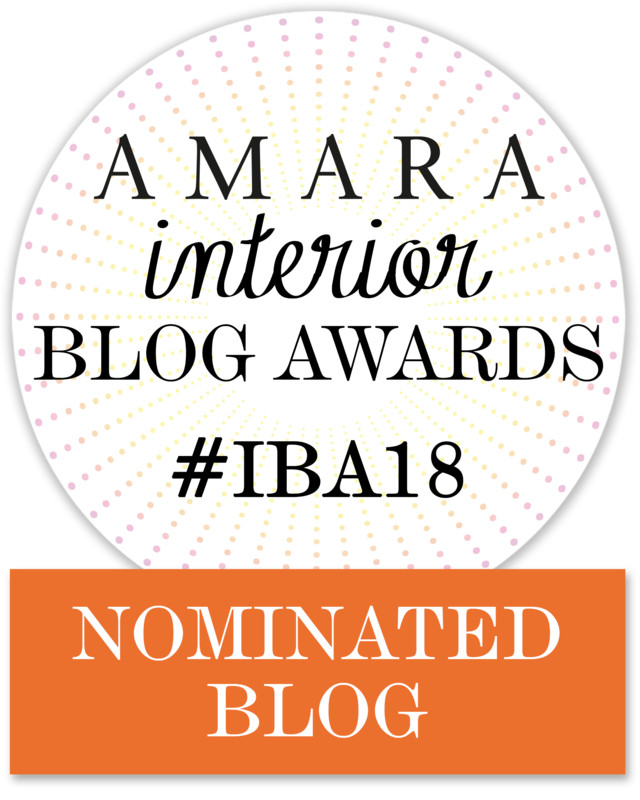 To quote Vanessa her style is ‘inspired by eclectic British and African culture infused together, giving a taste of the exotic, whilst remaining quintessentially British‘. Vanessa’s lampshade are all handmade and being bespoke are tailor-made for your home. 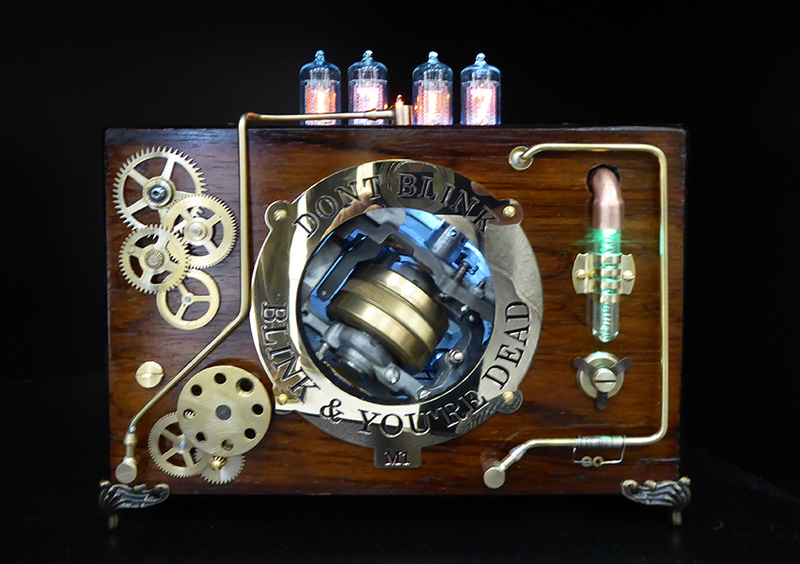 The last category I have to introduce, by way of including one of my most inspiring makers, is Invention. I have long been a admirer of Bad Dog Designs on social media and I was very excited to see these Bad Boys in real life. It was great to meet Paul and get to ask him how he creates these amazing Nixie Clocks. Paul finds various vintage instruments to renovate. 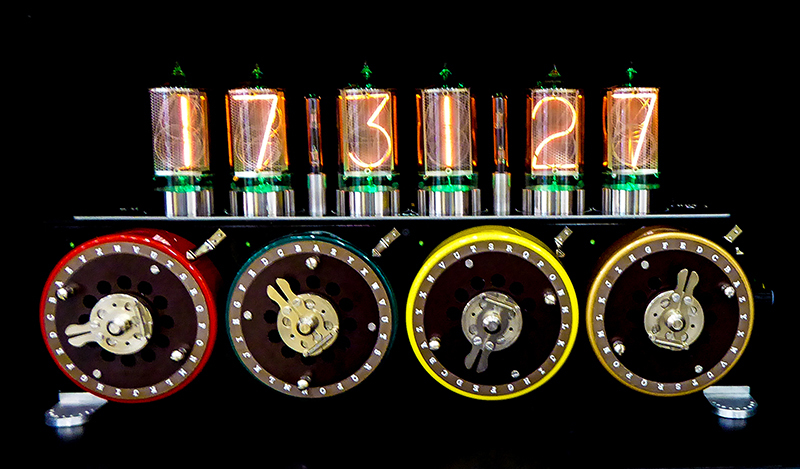 Then after adding salvaged vintage Nixie light tubes, from the 50’s and 60’s, he drives them with the latest microprocessor technology. 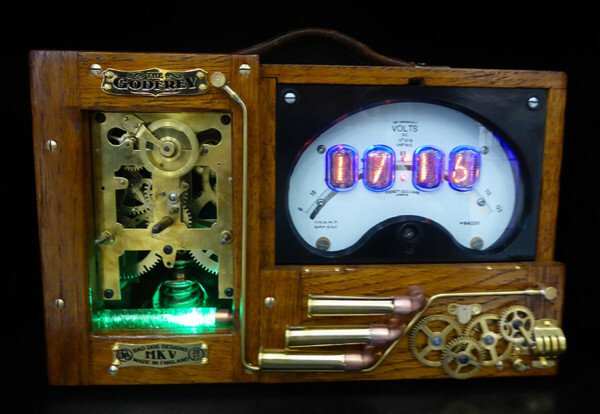 I do find it so ingenious how these amazing clocks work and would have loved to have taken one home with me. I think that Paul’s designs just sum up what the Design Festival is all about – Is it a clock, or is it a work of Art? Or is that quandary just the essence and aspiration of great Design.